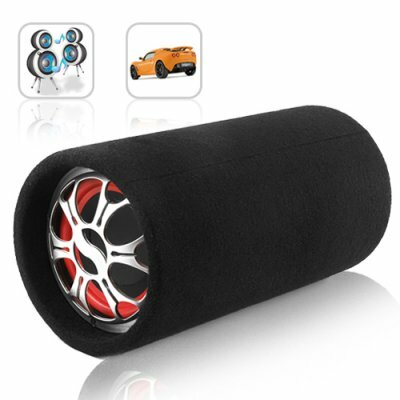 Successfully Added Torpedo - 6 Inch Amplified Subwoofer + Audio Speakers (100w) to your Shopping Cart. This 100 watt amplified subwoofer with built-in stereo speakers comes fashionably and ergonomically designed coupled with an MP3 player audio port, LPF dial, as well as Full BASS control for the ultimate home and in-car audio enjoyment. The Torpedo 100 watt amplified subwoofer is built with both high input and high output bridge ports located at the rear, as well as left and right RCA channel speaker inputs, MP3 audio port, BASS switch, LPF dial control, volume control, GND, 12V and +REM live wire connectors, that all contribute to enhancing your audio needs. The Torpedo amplified subwoofer is much better than regular subwoofers. It multiplies your external speakers' wattage by twice their actual wattage value. This means, when you decide to connect external stereo speakers to this amplified subwoofer, your external speakers wattage will increase, thus providing you with maximum audio performance. What makes this subwoofer sound system so special is its ability to be bridged with other subwoofers using the high input/output bridge connections located at the rear of the subwoofer, as well as being able to use it as a stand alone sound system in your home. The Torpedo amplified subwoofer with built-in stereo speakers is in stock now and brought to you at a factory direct wholesale price by Chinavasion. Click "Add to Cart" now, and we'll express ship you a sample right away to see for yourself, how powerful and amazing this complete sound system really is. If your speakers are 50 watts, then this subwoofer will amplify you speaker to 100 watts. Really this product is very perfect for small cars you can adjust inside back of you folding seats. I have my vitz car this fit perfect back seats and the bass quality is very good l like it.